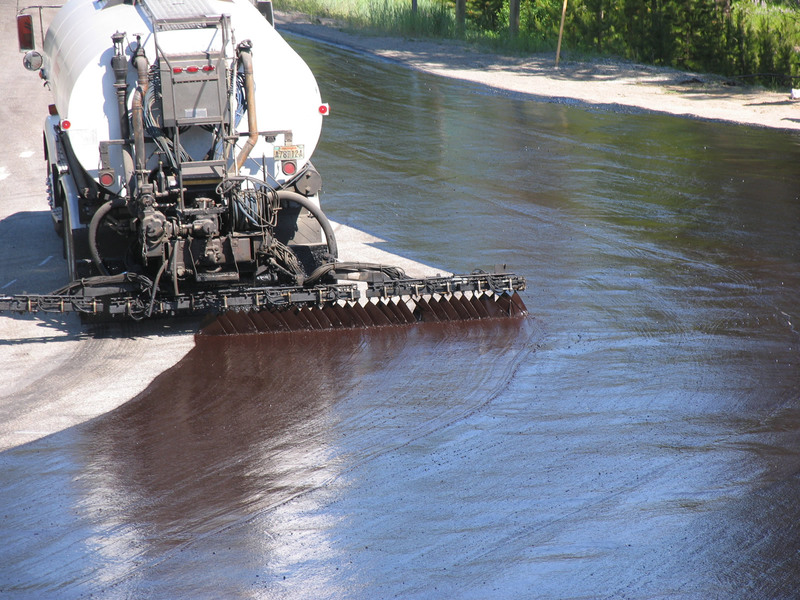 Emulsified asphalt is simply a suspension of small asphalt cement globules in water, which is assisted by an emulsifying agent (such as soap). The emulsifying agent assists by imparting an electrical charge to the surface of the asphalt cement globules so that they do not coalesce (Roberts et al., 1996). 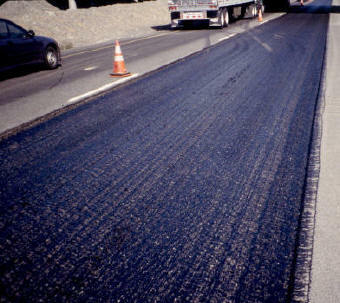 Emulsions are used because they effectively reduce asphalt viscosity for lower temperature uses (tack coats, fog seals, slurry seals, bituminous surface treatments (BST), stabilization material). Emulsions are typically either anionic (asphalt droplets are negatively charged) or cationic (asphalt particles are positively charged). Generally, emulsions appear as a thick brown liquid when initially applied (Figure 1). When the asphalt cement starts to adhere to the surrounding material (aggregate, existing surface, subgrade, etc.) the color changes from brown to black (Figure 2) and the emulsion is said to have “broken” (Figure 3). 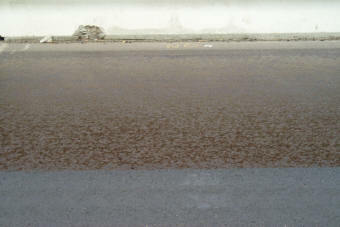 As water begins to evaporate, the emulsion begins to behave more and more like pure asphalt cement. Once all the water has evaporated, the emulsion is said to have “set”. The time required to break and set depends upon the type of emulsion, the application rate, the temperature of the surface onto which it is applied and environmental conditions (TRB, 2000). Under most circumstances, an emulsion will set in about 1 to 2 hours (TRB, 2000). ASTM D 3628 contains guidance on selection and use of emulsified asphalt. Figure 1. Freshly placed emulsion tack coat. The brown color indicates that it has not yet broken. Figure 2. Same tack coat after 23 minutes. The brown color now appears in splotches indicating it is beginning to break. Figure 3. Thin tack coat application using an asphalt emulsion. It has turned a black color indicating it has broken. Figure 4. 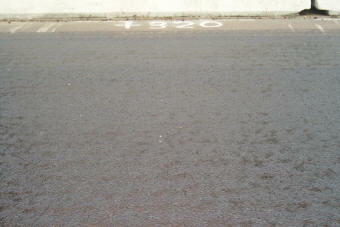 Freshly placed asphalt emulsion for a bituminous surface treatment; notice that the application rate is higher than that for a tack coat.